Sober Look: Short EUR futures charts "have a look of an accident waiting to happen"
Short EUR futures charts "have a look of an accident waiting to happen"
As discussed last week, futures traders have piled into the long USD trade. And as one would expect, the other side of the trade represents the short EUR futures positions, where the "crowded trade" scenario may be taking place as well. The fundamentals of being short the euro are quite compelling of course, but once again one needs to be cautious because of the technical factors. The chart below shows the net EUR futures positions, with record levels of short exposure. 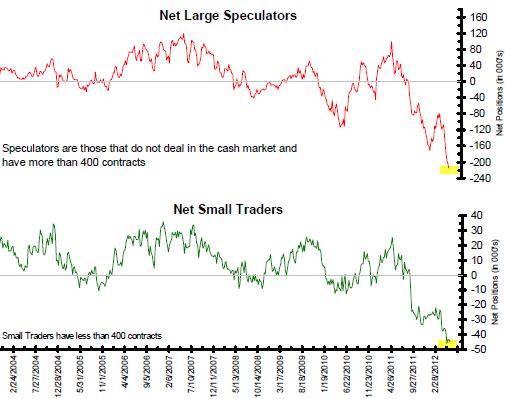 It's important to note that it's not just the large speculators but also "small traders" who are involved in this trade. As Bianco Research points out, "these charts have a look of an accident waiting to happen."